Why is dramatic play important for children? Why encourage make believe? Why is having a nicely stocked dress up trunk with costumes and props more than just a fun and fantastic idea for any house with young children and every pre-school classroom? Let’s dig into these questions here today… and find out why dramatic play is important! First we’ll look at the question “What Is Dramatic Play?”, then we’ll talk about “Benefits of Dramatic Play”, and finally we’ll look at what kinds of resources help encourage dramatic play! Dramatic play can look like many different things! 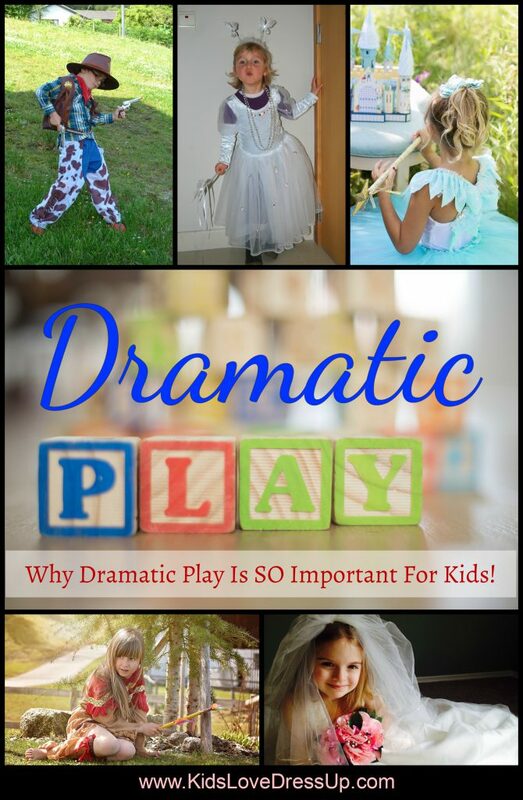 There’s no one defining way for your kids to “do dramatic play”. It can, but doesn’t have to, include role playing real or make-believe personalities, dressing up and playing with props and costumes, assuming different names, ethnicities, genders, ages, and more… but it always means FUN, and always includes some form of pretending. Playing “house”. Dramatic play centers could be a play kitchen with dishes, cutlery, and play food. Or, a doll’s bedroom, complete with bassinet, change table equipped with small diapers, etc. Or, a laundry station and clothes line with pins to hang up articles of clothing, etc. A library setting. Kids can pretend to be the librarian, the story hour leader, or the patron, performing the rolls of advising, checking out, or fostering a love of books. A garage or work-shop. Children can pretend that they are mechanics or carpenters, using play tools and equipment to fix “broken” cars and trucks or build things. A Veterinarian clinic. Some stuffed animals, blankets, a small inspection table, and a collection of doctor’s tools makes a fantastic dramatic play center for compassionate kids. Playing “Store”. Kids love to pretend to buy and sell things – whether they are the sales person and cashier or the shopper, handling money and that awesome cash register is always a hit. Playing Superheros or Princesses: Children are GREAT at coming up with a story line (often similar to a book they’ve read or movie they’ve seen), and adapting it to their imaginative play, especially if they have some great superhero or princess costumes! What Are Benefits of Dramatic Play For Children? 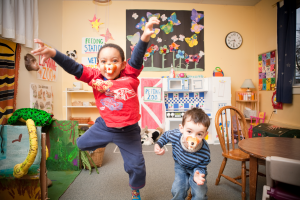 So much of dramatic play involves decision making – creative decisions, that is. “Where should I land my space rocket on this bumpy moom?” “How can the princess get free from the dragon?” “What will we serve for dinner at our restaurant?” “How can we firemen put out that HUGE fire?” While the little ones are playing, their little minds are running BIG time. They are having a great time playing, but really, they are also practicing the oh-so-important skill of creative problem solving. A skill that will grow more and more valuable as they mature. When children are presented with the tools for dramatic play and the playing begins, there is a ton of social interaction that also begins amongst them. Dramatic play encourages the practicing of social skills such as interactive decision making, cooperation, negotiation, and compromise. These are skills that will help a child his or her whole life. Let’s look at an example. 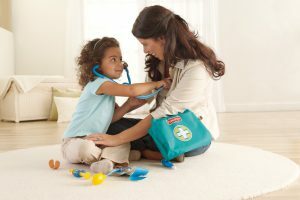 Say there’s a doctor kit and a medical jacket (like THIS doctor role play set, for example) in the dress up box that looks new and exciting. The children will have to decide out what to do with them. Will they pretend to be doctors? Or nurses? Or veterinarians? Are they playing hospital, or doctor check-ups? Who will be the doctor and who the patient? Will they take turns? And the decisions go on. 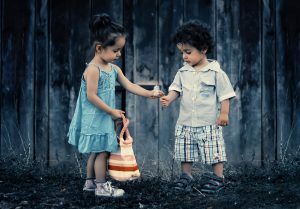 Children are by nature ego-centric, that is, they are the center of their own universe. Dramatic play encourages them to step outside of the “me” mentality just a little bit. Learning to really assume the role of another character can be difficult at first for some, but kids quickly get the hang of it. One way to get them started is to think of one of their favorite show characters (Superman, Dora the Explorer, Princess Elsa)… and play act that they are that character. Calling him by that name, devise a scenario for him to play act out… like “Oh, Superman, my puppy is lost! I know you can fly! Can you do something super-amazing to find him quickly? ?” And then hand the ball, so to speak, to him, and see what happens! Role playing builds empathy for others. When children assume the identity of another character, they learn that other people have feelings and ideas too! An example here would be two girls playing “Mommy and Child”, where Mommy doesn’t let Child do something that might hurt her (ie., put her hand into the “oven” because “it’s hot, you’ll get hurt”). Or, children playing “Farm”, and the farmer is sad because his hens aren’t laying any eggs that day, or because the storm ruined his crops. Another reason why dramatic play is important is that when children are busy with dramatic play, it inevitably leads to a growth in their vocabulary. They learn the names of objects related to the “game”, the process involved in playing it (how that center works), and more! Take the example in the picture. In this Optometrist Dramatic Play Center, the children there learn how to use words such as optometrist, glasses, frames, lenses, fitting, eye chart, and more! What Are Resources That Will Help You Encourage Dramatic Play? 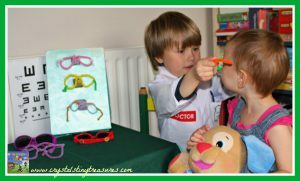 The Fisher Price Doctor Kit is a fantastic dramatic play set! Dramatic play becomes appealing to children when you change up the props, play areas, and costumes regularly! Consider not putting everything you have out at once – swapping items throughout your school year (if you’re a teacher) saves your classroom budget AND keeps things “new” for your kids. New = exciting, remember? And if you’re a parent, the same applies… sometimes tucking something away for a while and then reintroducing it at an opportune time is the best thing you can do for your kids’ play! This website here, Kids Love Dress Up, is all about the Dressing Up part of dramatic play. While costumes and accessories are not a vitally necessary part for great dramatic play, they do help children really get into character and really make it a lot of fun! 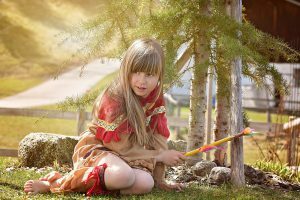 Little Girls Dress Up Clothes: 10 Inspiring “When I Grow Up” Costumes – roles that are more commonly perceived as “for girls” (again, both genders can enjoy playing with most of them). Our Home Page: Check out the up-to-date lists of pages on this website! From princess gowns to superhero costumes, from specific character costume collections to accessories pages, there’s something that will probably catch your eye! Thanks for visiting! Do YOU have anything to add to “Why Dramatic Play Is Important for Children”? 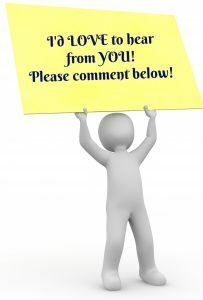 I’d love to hear from you about your experiences with dramatic play with the children in your lives! Do you have memories of dress up play and creative play from your own childhood to share? Like this article? Pin this image! I’m a mother of 3 young adults and grand mother of a young boy (6), but I work as a part time baby sitter for 3 young boys (7) yes they are triples. I have been working for this family for about 5 years now, so I have seen them growing. I’m quite impress by your article, I know playing is important for children, but you wrote this great article about Dramatic Play. How great children can learn from a game, it’s a great idea to have a trunk with costumes and props ready for them. This will provide them with some fun at the same some learning time. I should talk with the triples’ mother about this idea, I don’t like to see the triples spend too much time now in front of the computer just playing games. Babysitting triplet boys would be quite an adventure!! I’m sure you have more than a few crazy stories about creative play you’ve seen them busy with. How fun! I agree with you that children need to be playing actively, and not just be in front of screens. It’s so important for their development, to engage is healthy, active play. I’m sure their mom is so glad to have a babysitter who feels this way. Keep up the great work! I still remember that when I was a kid then I used to be so excited. You have clearly explained here the genuine excitement that kids have during a dramatic play and how it actually helps them grow as a person. I remember how my niece took her plays so seriously and did everything to be fully prepared for it. Thanks for commenting, shrey! I love watching children deep in play! They do get “so serious” about it, don’t they? I think it’s because play, for kids, is (and should be, IMO), their job! It’s where they grow, learn, and have genuine fun. My son who has a special need loves drama. He performed in a Shakespearean School Festival last year and was so happy and enjoyed every bit of it. He learned so much from the experience because it has boosted his confidence and social skills. He also learned how to take turns and knows when it time for him to act. It was indeed a pleasure to see him act on stage and be a part of this wonderful experience. What a wonderful, enriching experience he must have had – I’m sure you were so proud watching him! Thank you for sharing about it with me! I don’t think there is anything more satisfying then watching kids having fun and role playing in a dramatic way. There are clothes trunks in our garage where the girls used them as school desks. Names are scribbled on top in crayon that still stays there. Everytime I walk by them I still smile and think of those good times. They are both in their 30’s now. Thanks for this very enjoyable read. Playing “school” is a FANTASTIC dramatic play activity for little ones! I love watching and playing with my own kids – I think I’ll be having wonderful memories of these times, like you do now, when my kids are older. Thanks for commenting, and have a lovely day!